I was looking on Craigs List and decided to look for Cockatoos. 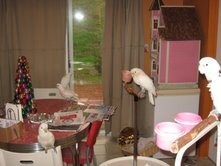 I was so saddened to see more than 20 cockatoos in need of new homes. Noise, biting and “my spouse is not a fan” were the main reasons. Parrots First currently has 6 toos in their care. They are fabulous, but also so much work. Wish we could get everyone wishing to share their life with a too to see some of the mutilators and pickers and know what could go wrong before they decide. This entry was posted on Tuesday, November 3rd, 2009 at 7:20 pm and is filed under Uncategorized. You can follow any responses to this entry through the RSS 2.0 feed. You can leave a response, or trackback from your own site. I wish to adopt into a forever home on my ranch a cockatoo thats needs lots of love, care cuddle time, but won’t bite my granddaughter when she comes for a visit. 18 queries in 0.108 seconds.